Also known as the Festival of Speed, Goodwood (July 12-15, 2018) is one of the largest motoring garden party in the world, an event which brings together some of the world’s most accomplished racing drivers behind the wheels of some of today’s rarest and most spectacular machinery. 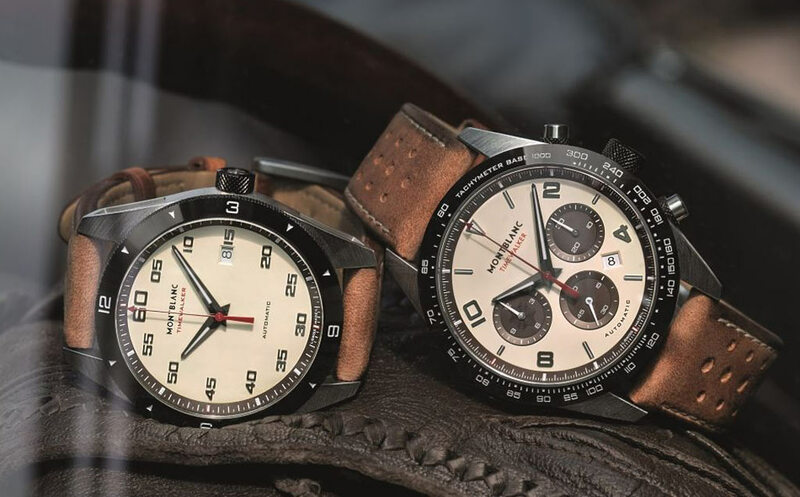 On occasion of the event, as the Official Timing Partner for the second year running, Montblanc presented two new limited edition models that have been inspired by the colour of the tropical dial effect: the Timewalker Manufacture Chronograph and the Timewalker Automatic Date. 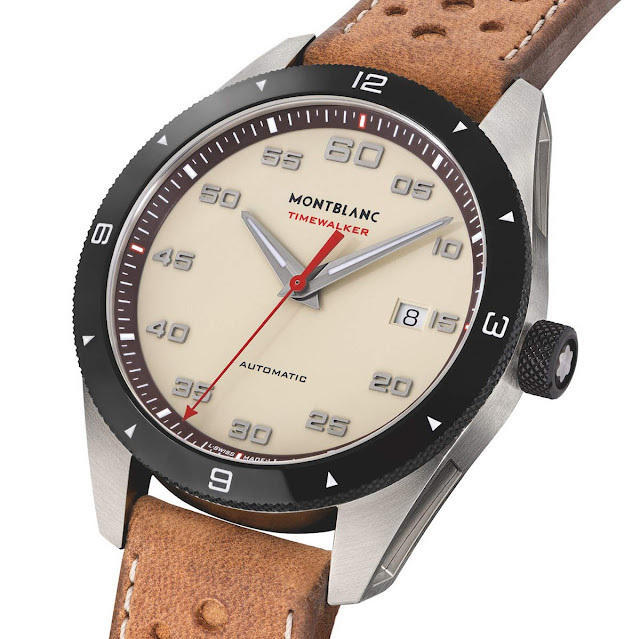 For their beige dials with brown counters and brown flanges, the two new watches have been nicknamed “Cappuccinos”. Produced in 1500 pieces, the Montblanc TimeWalker Manufacture Chronograph Limited Edition (ref. 118491) combines a tri-counter “panda” dial with a Manufacture automatic movement. The dial has a flange with a 5-minute track coated with Super-LumiNova for high visibility day and night. Other features include rhodium-plated, dauphine-shaped hour and minute hands and a red chronograph second hand inspired by the Minerva arrow, a nod to Minerva’s legacy and heritage. 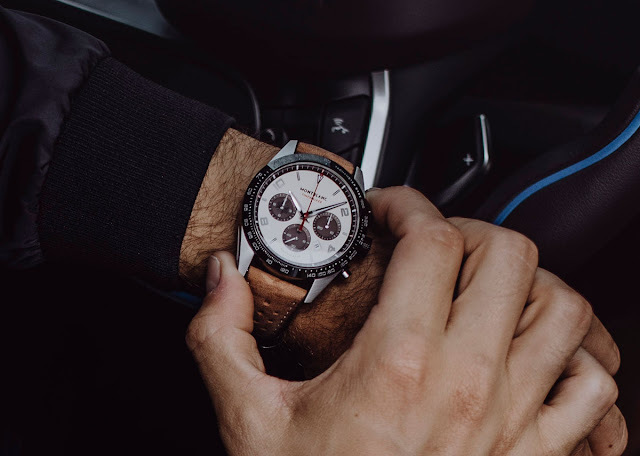 The satin-brushed finish of the 43 mm stainless steel case enhances the automotive look while offering better resistance to scratches. The fixed black bezel engraved with a tachymeter scale is made of shiny high-tech black ceramic. The horns are characterised by carved flanks, somehow reminiscent of the air inlets of a car’s body. Another automotive-inspired detail is the black DLC crown which, like vintage car radiator caps, has been knurled for better gripping. 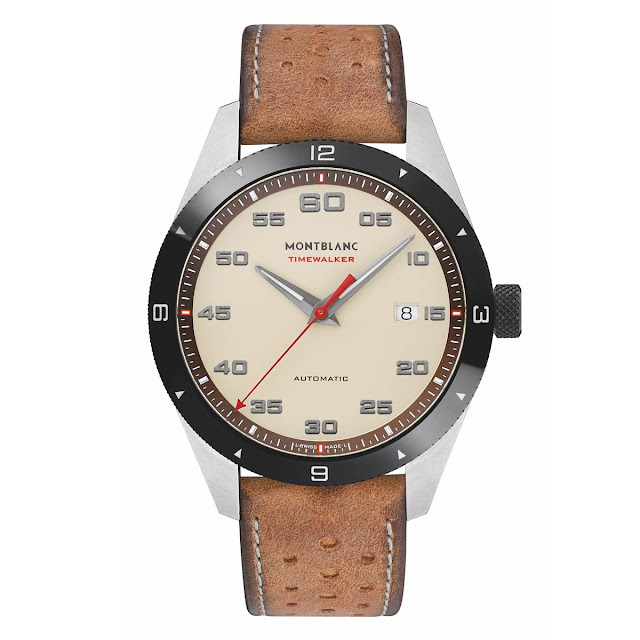 The second model is the Montblanc TimeWalker Date Automatic (ref. 118494) which will be produced in a limited edition of only 500 pieces. The 41 mm stainless steel, satin-finished case is matched to a high-tech black ceramic bezel but in this case it is a unidirectional rotating bezel with an engraved silvery-white 12-hour scale. Protected by a scratch-resistant, domed and antireflective sapphire crystal, the beige dial is characterised by the rhodium-plated Arabic figures indicating the minutes and the red seconds hand with Minerva arrow at the end. 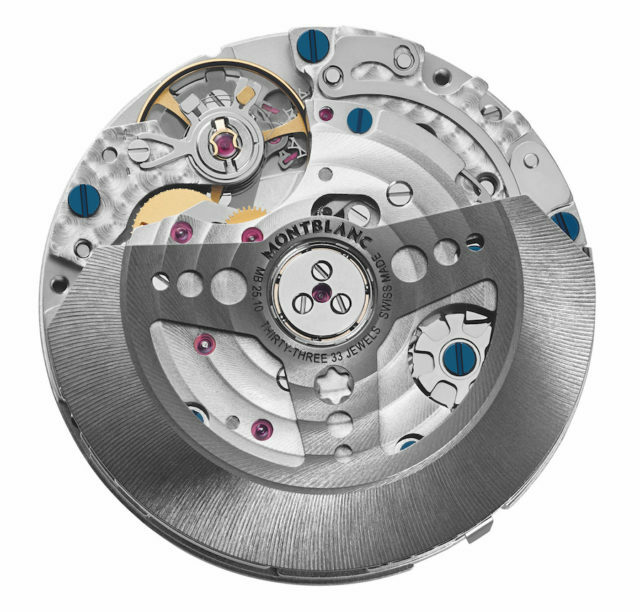 The movement of choice is the self-winding Calibre MB 24.17 offering a power reserve of 42 hours and beating at a frequency of 28,800 A/h (4 Hz). Montblanc - Timewalker “Cappuccinos”. As the Official Timing Partner of the Goodwood Festival of Speed; Montblanc presented two new limited edition models that have been inspired by the colour of the tropical dial effect: the Timewalker Manufacture Chronograph and the Timewalker Automatic Date. 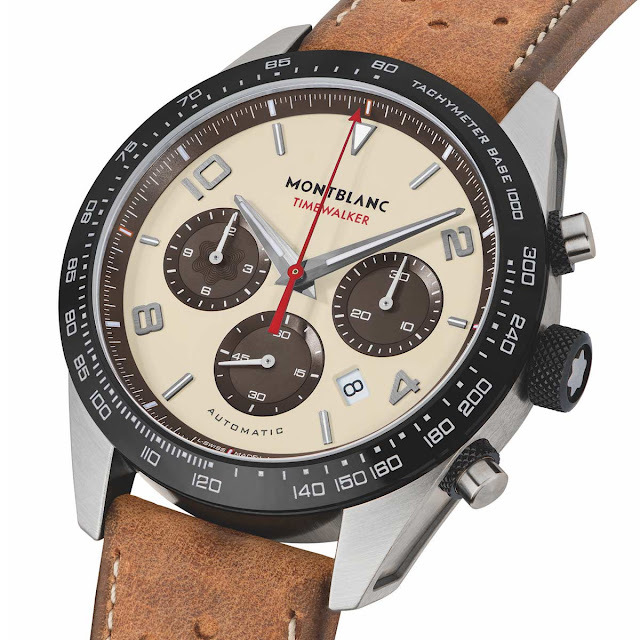 Produced in 1500 pieces, the Montblanc TimeWalker Manufacture Chronograph Limited Edition (ref. 118491) combines a tri-counter “panda” dial with a Manufacture movement. 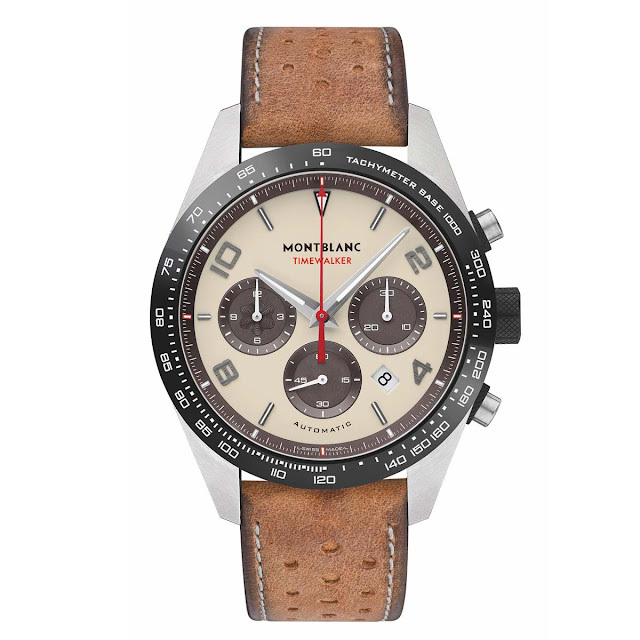 The second model is the Montblanc TimeWalker Date Automatic (ref. 118494) produced in a limited edition of 500 pieces. Prices: Euro 4,990 for the TimeWalker Manufacture Chronograph Limited Edition (ref. 118491) and Euro 2,760 for the TimeWalker Date Automatic (ref. 118494).